I don't know how he does it, but Adrian Tchaikovsky manages to get inside the heads of different creatures and allow us to see through their eyes. Last time I read one of his books it was Spiders, this time it's Dogs, Bears, Bees and Lizards. 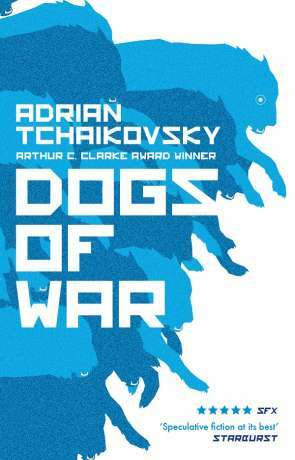 Dogs of War imagines that we've got to grips with bio-engineering to the degree that we can create powerful, loyal, obedient soldiers by taking a big dog, making it bigger, smarter, providing a voice and integrating it with smart tech. Given the loyalty dogs have to their owners you then have a frighteningly powerful, loyal soldier that will follow orders to the letter. Of course you don't want to make them too smart to the point they begin independent thought and question what makes a dog good. Having mastered this process the natural progression is to bio-engineer other forms (known as bioforms) - the powerful and clever bear, the ruthless and efficient lizard and even the perfect reconnaissance drone in a swarm of Bees. These creatures make up the squad we follow through this remarkable, intelligent and engaging book. Led by Rex (the dog) who in turn is commanded by his "master" the cruel and ruthless mercanary leader Murray. Rex wants to be good, something that isn in both his natural genetic ancestory and his hardwired bio-engineering technology encourages. His squad are ruthless in their efficiency and stop at nothing to complete their mission. As you might imagine, things go a bit ka-ka and eventually Rex and his group find they have to make a few decisions for themselves without anyone to guide them or decide what is good or bad. Ultimately Dogs of War is an examination of ethics, humanity, freedom and the rights of those who lie outside the "accepted norm". There is also an exploration of technological and biological advancement, the problems and pitfalls this can cause. It also explores intelligence and sentience. Where is the line? How do we decide that something deserves the right and priviledges that seem to come with sentient beings. You might expect examining such big questions sacrifices some of the readabilty - you'd be wrong. Dogs of War is accessible, engaging and fast paced fiction that really draws you in. It's an emotional journey, bmaking you care about the lives of Rex, Bear, Dragon and Bees. It's one of those books that keeps you hooked all the way through, I read it in two sittings - and if it wasn't for needing things like food and sleep I would have read it all in one go. Dogs of War is exceptional, a rewarding, effortless read that asks some big questions and delivers a great story at the same time. Unmissible. Written on 4th June 2018 by Ant.